Twitter’s chief executive has been criticised for promoting Myanmar as a tourist destination despite widespread allegations of human rights abuses in the country. A Myanmar court jailed three activists on Friday for defaming the military during anti-war protests, amid growing concern about a clamp-down on civil society. A human trafficking syndicate was busted after police arrested three Myanmar nationals, two men and a woman, under ‘Ops Pintas’, here, today. Myanmar’s government has played its cards well in the U.S.-China competition for influence. 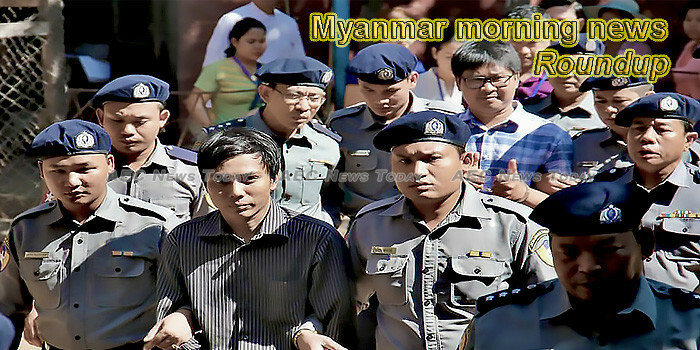 Authorities in Myanmar should quash the convictions of three ethnic Kachin activists found guilty of defaming the military, NGO Human Rights Watch (HRW) said today. A standoff over citizenship guarantees and concerns about safety have diminished the likelihood of large-scale repatriation, with government officials saying Rohingya demands are “impossible”. Myanmar’s minister of religious affairs has been rebuked by “top leaders” for using the term “extremist religion” to refer to Islam in recent racially charged comments he made referring to the country’s persecuted Rohingya Muslim ethnic minority, said a government spokesman on Friday. Stepping up his administration’s anti-graft efforts, President U Win Myint has approved the creation of corruption-prevention units within government departments. The Special Representative of the Secretary-General on Sexual Violence in Conflict, Ms. Pramila Patten, signed a Joint Communique between the Government of Myanmar and the United Nations to address conflict-related sexual violence in Myanmar. Myanmar has formed a steering committee for implementation of tasks relating to the China-proposed Belt and Road initiative, according to the government’s Gazette Friday. President Ram Nath Kovind’s first visit to Myanmar starting on Monday will be an occasion to build upon the strong bilateral relationship with India’s biggest link in the Asean region. Through the Directorate of Technical Cooperation of the Ministry of Foreign Affairs, Indonesia has sent two agricultural experts to Myanmar to provide quality improvement training in the field. Food supplies cannot be transported through Chinese territory to over 70,000 Kachin Internally Displaced People (IDPs) staying along the Sino-Myanmar border because of a war game being conducted by the army of the People’s Republic of China. Sittwe Port in Myanmar, being administered by the Ministry of External Affairs under the Kaladan Multi-Modal Transit Transport Project to facilitate connectivity between the mainland and the north eastern states of the country is “ready” for operations, an official said on Friday. An agreement has been signed by Magwe regional government and Infra Capital Myanmar-ReEx to carry out feasibility studies for a wind power project in the region. The early implementation of bilateral border trade cooperation zone and the promotion of border trade, and investment between Myanmar and China were during a meeting earlier this week the Ministry of Commerce has announced. Myanmar Apex Bank Ltd (MAB) will provide loans for SMEs based only on the companies’ income and expenditure, senior MAB officials announced. As the tax to GDP ratio for Myanmar is lower than that of its regional peers, successive governments have prioritised more efficient tax collection. Investors eyeing expansion opportunities in Myanmar might want to consider Ayeyarwady Region, where the government is now prioritising developments in the agriculture, livestock and marine, forestry, industry, infrastructure, transportation and tourism sectors, said regional chief minister U Hla Myo Aung. A stake driving ceremony has been held in Manaung township, Myanmar’s Rakhine stake to build a solar power plant which can supply 24-hour electricity to more than 1,000 households, Myanmar News Agency reported yesterday. Police have begun an investigation into the complaint of a private bank against a company for their failure to repay a 1.5 billion kyats ($644,000) loan, said officials of Pabedan Township Police Station in Yangon. Ministers and senior policymakers across Asia and the Pacific gathered in Bangkok last month to focus on population dynamics at a crucial time for the region. Their goal: to keep people and human rights at the heart of the region’s push for sustainable development. The Myanmar government needs to work with the international community to resolve the turmoil in Rakhine State, Knut Ostby, UN resident humanitarian coordinator in Myanmar, said. Speakers and deputy speakers of the 14 regional and state parliaments met in Nay Pyi Taw this week to discuss ways to improve cooperation among them and with the Myanmar parliament. Janet Jackson ended her nearly 20-year career with the United Nations Population Fund (UNFPA) as the agency’s representative in Myanmar. She retired last month. Two men were killed in a landmine explosion Thursday night along a road in northern Rakhine State linking Rathedaung and Buthidaung townships, where the Myanmar military and Arakan Army (AA) have been fighting recently. Ma Hla Myat (not her real name) discovered she was HIV positive after her husband died of AIDS. Relations between the National League for Democracy-led government and local media have turned sour lately. The situation must be addressed by the government. How to radically improve criminal procedure in Myanmar without spending much money or having to rewrite any laws. In Kayin State, the upgrade of one of the country’s most important highways has been brought to a standstill and the blame game is in full swing. A media trip to northern Rakhine State becomes an exercise in government obstruction and disorganisation. With more than 130 brands from 13 countries’ showcases, the 7th Myanmar International Textile & Garment Industry Exhibition (MTG) took place at the Yangon Convention Center this week, highlighting the vibrant textile and garment industry in Myanmar and an unexpected spin-off from the US-China trade war. Despite the threat of jail in February of this year, Ko Swe Win, editor-in-chief of the nonprofit news site Myanmar Now, refused to apologize. The year before he had shared a critical story on Facebook about ultranationalist Buddhist monk Ashin Wirathu, known to stoke tensions against Myanmar’s Muslim community. Registered workers in Nay Pyi Taw may get better access to healthcare because of a cooperation project between the Social Security Board (SSB) and May May Special Clinic in Thapyaekone Market. It’s a sunny, peaceful day on the grounds of the monastery. Aside from gongs and the occasional distant recitations, it’s mostly just the sounds of birds, or some traffic from outside. Everything about the donation procession for the local pagoda — a routine sight in villages around Myanmar — was going according to plan. Right up until the elephant went off script. Melia Hotel Yangon’s new high tea set is a sweet and savory delight. Relax with friends during this sweater-weather season over a tea or coffee set served up amid the beautiful, white interiors of the hotel’s Olea Mediterranean Restaurant.